Celtic boss Brendan Rodgers said the officials did not have “one of their better games” as his side had a man sent off in a draw at St Mirren. The champions lost Olivier Ntcham to a second booking in the first half. It was a decision the Celtic manager described as “disappointing” in the wake of the 0-0 draw. “Olivier had tracked back and conceded a free-kick just before, so I don’t know if that was in the referee’s mind,” he told BBC Scotland. 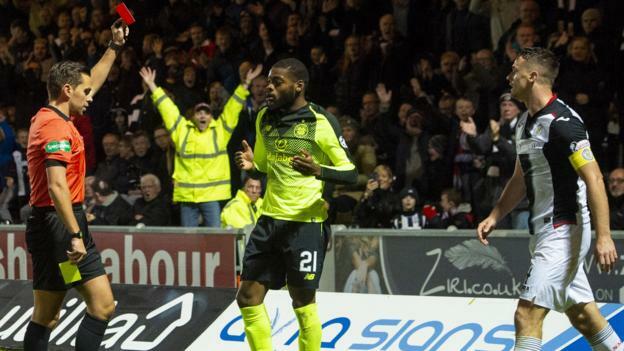 Resurgent under new manager Oran Kearney, St Mirren started brightly in Paisley as Celtic struggled to find their rhythm. Rodgers acknowledged that slow start, but said the sending-off of Ntcham did not negatively impact the momentum of the match for his team. The draw leaves Celtic two points behind Premiership leaders Hearts, who play on Saturday away to Motherwell. “We didn’t start the game well. We missed too many passes and didn’t move it quickly enough,” said the Celtic boss. Rodgers refused to criticise his players despite the draw against St Mirren, adding: “The players gave everything on the back of an international break. “St Mirren were always going to be spirited in Oran’s first game. It’s another clean sheet, it’s a point.